Alber Elbaz wrote the book on lust-worthy fashion design. No, really, he wrote a book about it, and it's finally out. Celebrating his 10 years at the house, the book, Lanvin (Steidldangin), is a 688-page account of one collection, telling the story—and showing it, through hundreds of photos by But Sou Lai—of all those who participate in making it a reality. 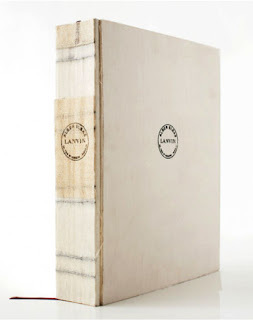 Of course, this being Lanvin, the limited-edition monograph comes with a cover handmade from a web of silk and gilded edges, justifying the €320 price tag. Αναρτήθηκε από kλik στις 6:11 π.μ.